It’s probably safe to say almost every parent has heard the advice that teaching kids good habits for healthy eating and a physically active lifestyle are learned best when the child is young. Old habits are hard to break, especially if they’re bad ones. One element of a healthy lifestyle is often overlooked, however, but it may be just as important in the long run as good eats and active play outdoors — how to manage money effectively. A piggy bank is a common fixture in many a child’s bedroom but some financial experts say kids will become better money managers if they use three piggy banks instead of just one. Each piggy bank holds money for different purposes and provides an effective tool for learning money management, not just spending or saving. Kids get money from many sources — allowances, gifts, and odd jobs around the house may be the most common sources of childhood cash flow. It can all be used to teach money management skills, especially when three piggy banks are used: one for spending, one for saving, and one for giving. Parents should work with children to establish an age-appropriate percentage of “income” to put in each bank but 50% to 80% is what the experts recommend for the spending bank. Let kids use this bank for everyday purchases: toys, movie tickets, snacks away from home. They’ll know. Consider allocating 10% to 25% for this bank. Set long-term goals such as spending money for summer vacation, holiday gifts, or college. Write the goal on the bank or tape a photo of the goal on the bank to add incentive. Earning interest encourages saving and provides a practical, hands-on way to learn about percentages. Parents may want to add an interest rate (5%?) to the bank each month as a reward for good fiscal behavior. Put 10% to 25% aside in this bank and encourage children to donate it to a worthy cause of their own choosing. Doing so enhances financial and math lessons but it also introduces the child to social responsibility. Suggest donating to your local animal shelter, disaster relief for local kids, church, schools in need of extra supplies, a local park or food bank. Kids love to give to others but will need parental help to make sure the investment goes to a worthy charity. Pay kids in small denominations that are easy to split between three banks: four quarters or ten dimes instead of one dollar bill, for example. Use clear mason jars as piggy banks so kids can see their money accumulating. 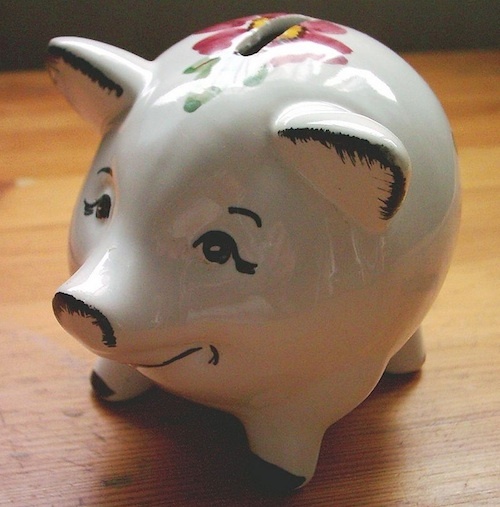 If seeing money increases desire to spend, hide it away in more traditional, opaque piggy banks. Threejars.com is a virtual piggy bank that teaches money management skills as well as makes it fun and easy for parents and children to track cash flow together. Keep track of money entirely online, with parental payouts coming as needed, or use the app to track the money that goes into and out of three real-life piggy banks at home. Tip: Parents who sign up for a new account before June 30, 2015, get a lifetime membership for free. "Introducing the 3 Little Piggy Banks." Better Money Habits. Bank of America, NA, n.d. Web. 3 June 2015. ThreeJars.com. ThreeJars Inc., 2015. Web. 3 June 2015.